Ratatouille is a traditional French dish made of eggplants, tomatoes, and zucchini. It's often served as a side dish with lamb or other meats or poultry — even fish. Served over rice or couscous, it makes a hearty meal. 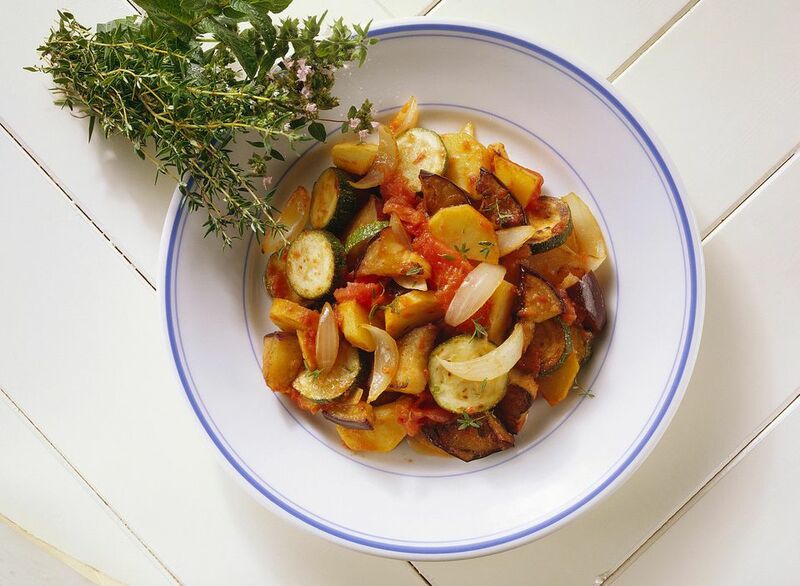 This ratatouille recipe uses zucchini, yellow squash, and toasted pine nuts. Heat a heavy bottomed sauté pan over medium heat for a minute, then add olive oil. When the oil is hot, add the onion, garlic and pine nuts and sauté for 3 minutes or until the onion is slightly soft. Add stock and eggplant and cook, stirring occasionally, for about 10 minutes or until the eggplant is tender. Add tomatoes, zucchini, and yellow squash and cook for about 10 more minutes or until the zucchini and squash are tender but still firm to the bite and brightly colored. Stir in the minced oregano leaves about a minute before cooking is finished. Serve garnished with a sprig of fresh oregano. While this recipe calls for chicken stock (or broth), it can easily be prepared with vegetable stock instead, making it suitable for vegetarians or vegans. Use 1½ tsp Herbes de Provence in place of the fresh oregano, and add them with the tomatoes, zucchini, and yellow squash, not at the end of cooking. This also applies to dried oregano if substituting it for fresh.